Ralph Stövesandt, born 1966, is a self-taught musician. He started playing guitar and trombone at the age of 12 and has been playing the musical saw since 1998. 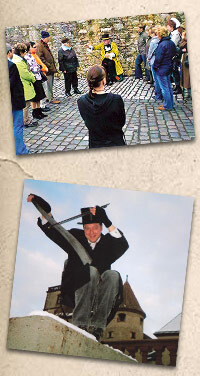 »HorchUndSchau.de – City Tours and Musical Saws« with Sebastian Karl and Ralph Stövesandt Ralph Stövesandt dedicates himself to delighting audiences with his musical saw playing. He has an extensive repertoire spanning classical, jazz and free improvisation, which enables him to respond immediately to his audience. Ralph and his musical saw have appeared in France, Italy, Spain, Poland, Austria, Switzerland and New York. 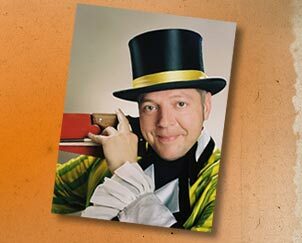 He can be heard most often in his home town of Würzburg in Germany. 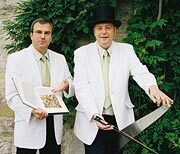 Here he joined forces with tour guide Sebastian Karl in 2005 to create the project 'City Tours and Musical Saws'. ( ).